RICHIE GIVES HIS REVIEW OF THE NEW NU LOOK & GAZZMAN DISIP SONGS (READ WHAT HE HAD TO SAY)! 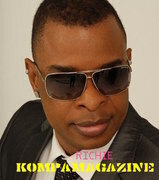 RICHIE gave Kompa Magazine his review of the songs released by NU LOOK and GAZZMAN DISIP. Find out what the ultimate HMI hit maker had to say. *RICHIE ON NU LOOK'S "SO WHAT" SONG! *RICHIE ON GAZZMAN/DISIP "PA KONDANE'M" SONG!